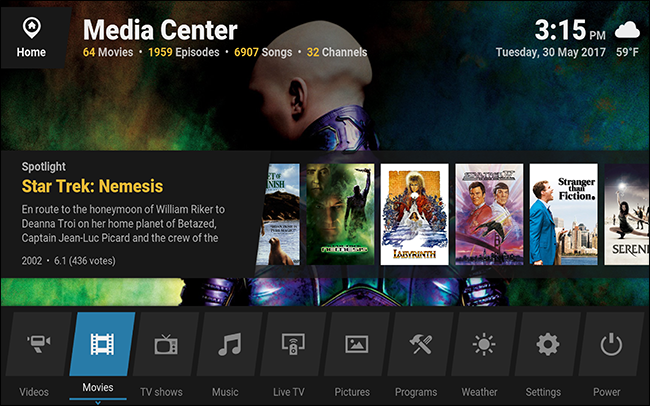 Ever wish Kodi looked…different? Maybe you’re not a big fan of how the home page is laid out, or you wish the typography and color choices were more (or less!) subtle. 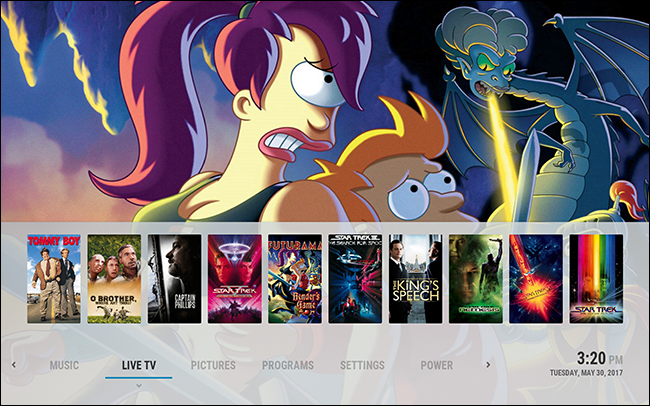 However you wish Kodi looked, there’s probably a skin that’s right for you, and many of them can be customized to your liking. Best of all, installing them isn’t hard at all. 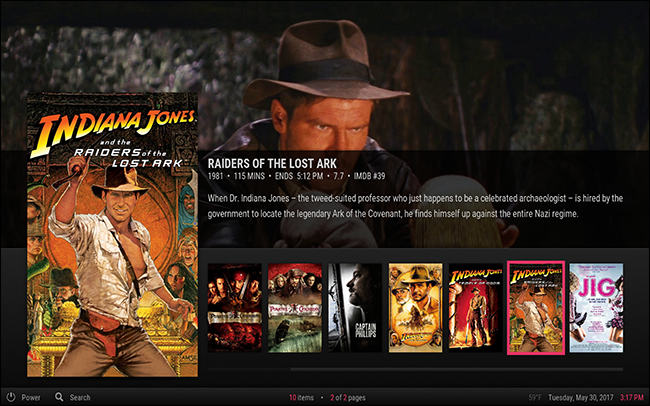 Earlier this year brought Estuary, Kodi’s new default skin, which is surprisingly customizable for a default: you can change everything from the color scheme to what is and isn’t on the home page. I suggest messing around with that before diving too much into custom skins, because it’s an extremely well-supported skin. 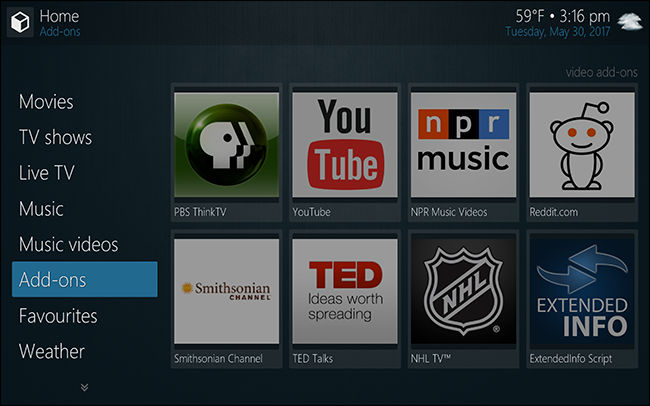 But if really want to make Kodi your own, here’s how to find and install more skins. 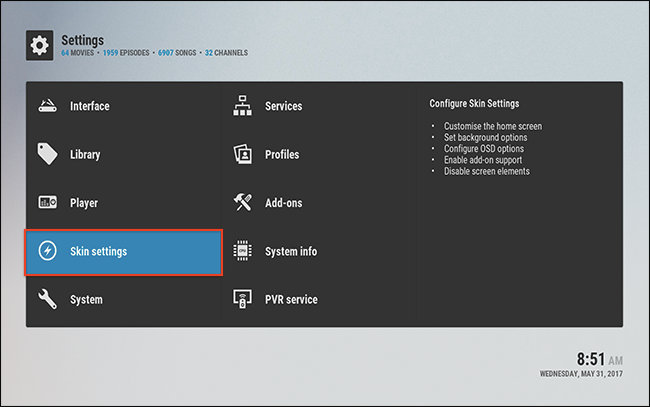 Skins are add-ons, meaning that if you know how to install Kodi add-ons, you know how to install Kodi skins. 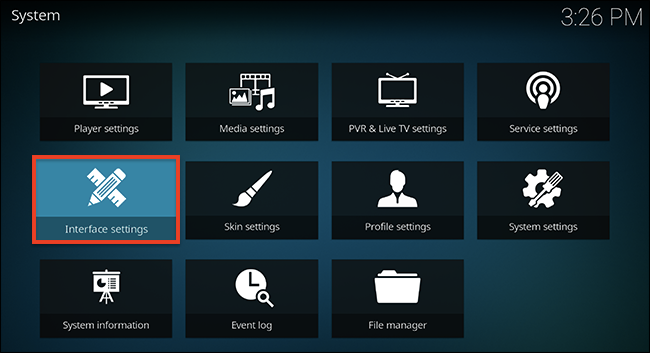 Kodi make things simple by adding a shortcut to downloadable things right in the skin selector in settings, so let’s head there. On the home screen, click the gear icon that opens the settings. From here head to the “Interface” section. The top menu item here lets you choose a skin. Select this and a window will pop up, in which you can select a new skin. 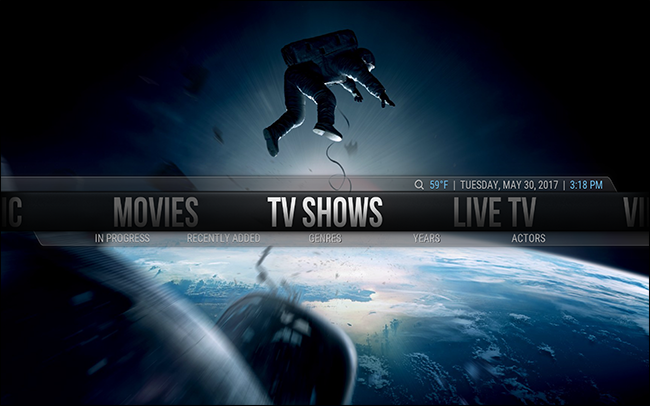 By default there are only two skins installed: Estuary, the Kodi default, and Etouchy, which is optimized for touchscreens. The “Get More” button takes you directly to the Skins section in the add-on manager, where you can easily download new skins to try out. Let’s explore a few, shall we? If you’re wondering which skins to try out, here are a few stand-outs we like. First, there’s Eminence, which offers easy-to-read text that still gives the fanart lots of room to breathe. By default it puts movies front-and-center on the home screen, though you can customize this if you’re willing to dig in. We’re also big fans of Mimic. The text is pretty thin, so anyone with a smaller TV may want to look elsewhere, but the look is very modern and everything is easy to find. If you want something that really stands out, check out (fuse)neue, which offers crisp text with a few striking highlights, and an interface that mostly stays out of the way. Most skins are customizable, but Aeon Nox is on another level. There are numerous custom widgets you can add to any section, and you also have completely control over the sections shown. You can lose hours tweaking this thing. If simplicity is what you’re looking for, Arctic Zephr builds on its snowy theme to make something crisp and refreshing. But below that simplicity lies a lot of customization options, which let you really build whatever you want if you’re willing to take the time. Finally, if you want something completely different, there’s Revolve, which attempts to build a circular user interface. Menus orbit around the circle on the left. It’s interesting, if nothing else. These are just a few skins offered in the default repository. 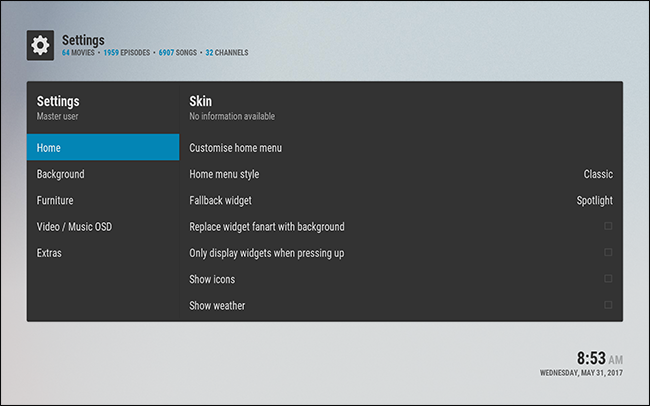 There are other skins in the default repository also worth checking out, and you can find more on the Kodi forum if you’re willing to deal with bugs. For the most part, however, the best supported skins are in the default Kodi repository, so we suggest all but the bravest users stick with those. As we’ve mentioned, most of these skins allow you to customize them. What you can customize depends on which skin you’re using, and we couldn’t begin to outline all the options for all the skins, so it’s best to just go browse the customization menu yourself. To get started, head to Settings, then find the “Skin settings” section. From here you’ll find all sorts of options. Again, what you can do varies by which skin you’re using, but generally you can change the background images and a few color options. You also might be able to change what does and doesn’t show up in the main menu, and which widgets show up over which menu items. If you find a skin you like, it’s worth diving into the settings and really making it your own. 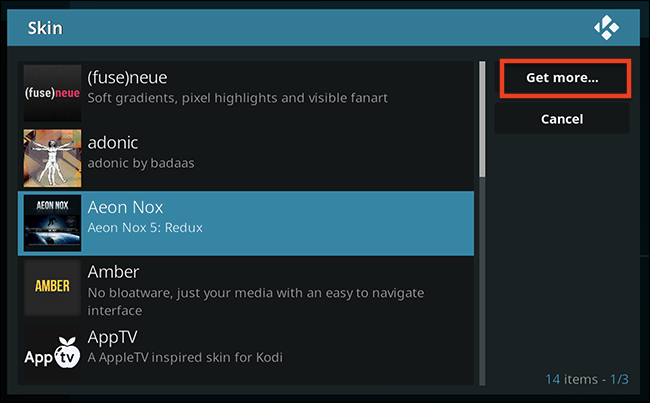 Take a look at our guide to customizing Estuary, Kodi’s default skin, if you want to see what kinds of things can be changed.